Renault e.dams can come away from Hong Kong very satisfied having picked up where they left off last season and given Sebastien Buemi yet another victory for his already-impressive tally in Formula E.
The team was expected to be at the sharp end again, but even Buemi admitted that the victory in the season opener was fortunate. A fourth place finish for Nico Prost helped ensure that the team heads the standings after round one. 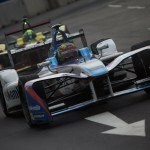 Testing proved a strong indicator that Renault e.dams would once again be in contention as we approached the Hong Kong ePrix, but a superb qualifying by the NextEV team threatened to throw a spanner in the works as Buemi got caught up in the train headed by Oliver Turvey as Nelson Piquet Jr ran off into the distance. The race turned on its head after Jose Maria Lopez crashed, forcing Piquet into an error that cost him the lead. A combination of this and a super-quick pit stop from the team gifted the lead to Buemi and kept a charging Lucas di Grassi at bay to open up his season three account with a win. Prost also benefited from the chaos that ensued from Lopez’s crash and rose from a lowly tenth position on the grid to finish less than two seconds away from the podium, despite having lost positions off the start due to a technical issue. 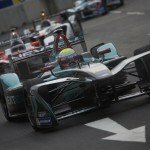 It looked as if Buemi would have some serious competition for the victory, especially after qualifying where the reigning champion could only manage fifth on the grid with both NextEV’s and DS Virgin’s ahead of him. The Swiss driver ran strongly throughout the race and kept touch with the head of the field despite Turvey playing rear gunner to the leading Piquet. Buemi was handed a stroke of luck before the pit stops as Piquet got caught up in Lopez’s crash at turn four, with Buemi managing to rise up the order through the pit stop phase that followed. Meanwhile, di Grassi had pulled off a storming recovery drive from an earlier incident and for a few laps looked like he could take the fight to Buemi, but the champion held on and crossed the line to get his title defence off to the perfect start. It was an anonymous day in Hong Kong for Prost, but one which yielded a superb finish despite multiple problems. A technical problem forced the Frenchman to pull off to the side of the track in first practice, before a below par qualifying only produced tenth on the grid, although this became ninth following a penalty for Loic Duval. Prost’s misery was compounded even further as an incorrect power setting saw him drop down the order off the start. From there onwards Prost surged through the field, picking off one driving after another while benefiting from another stellar pit stop by the Renault mechanic. At the end of it all, the Frenchman came home less than two seconds away from a step on the podium and ensured that his team would leave Hong Kong in the lead of the championship.